Permaguard Flea Spray is a domestic spray which long lasting, fast acting substances which kill both fleas and larvae. It is designed to quickly kill fleas and other insects on your carpets, soft furnishings and pet bedding. Once sprayed the effect can prevent the development of fleas for up to 12 months. S-Methoprene (0.1%w/w) and permethrin 0.5%w/w. Permaguard is intended to treat an entire house (carpets, soft furnishings, cracks and crevices and your pets bedding). First remove pets and children from the areas to be treated. Remove or cover fish tanks. 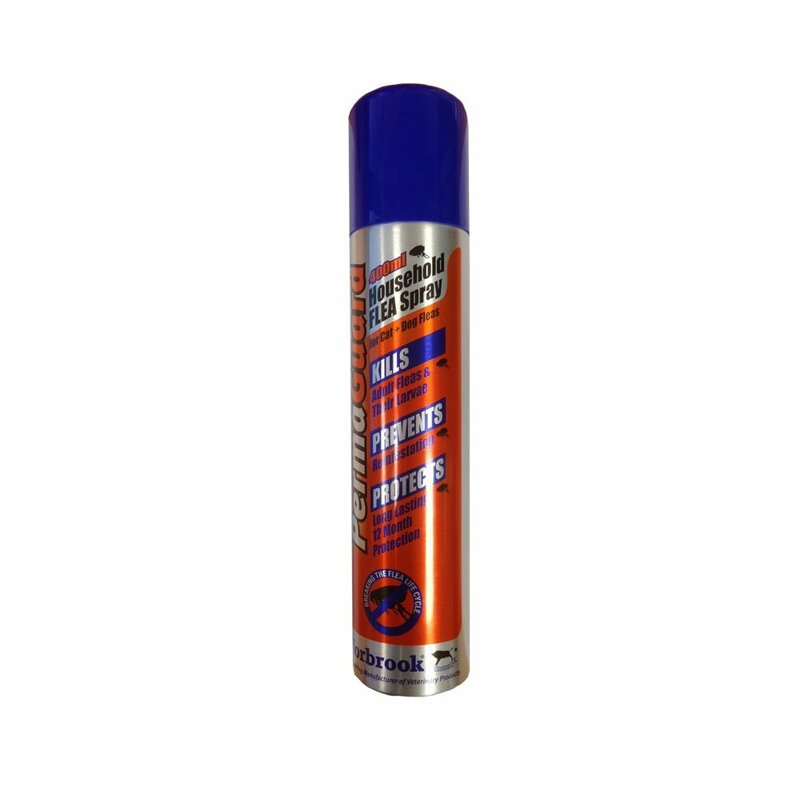 Spray lightly over the area to be covered from a distance of 50cm (approximately knee height). Use a systematic approach to ensure that all areas are covered. Do not wet the areas and use only lightly on glossy or wooden surfaces to avoid spotting. Leave each room for at least half an hour before airing. The product is designed to treat your pets bedding but do not apply directly to animals. Ensure their removal before use and until treated surfaces are dry. Avoid contact with eyes and skin. If contact occurs wash thoroughly with water. In cases of irritation seek medical advice. Wash hands and exposed skin after use. Do not handle treated materials until dry and air thoroughly following application. This is a pressurised aerosol. Protect from sunlight and other sources of heat. Do not puncture or burn even when empty. Do not spray on to or close to a flame or electrical equipment. Read instructions carefully before use. SURFACE SPRAY. KEEP OFF SKIN. WASH HANDS AFTER USE. Pressurised container: protect from sunlight and do not expose to temperatures exceeding 50.C. Do not pierce or burn even after use. KEEP AWAY FROM FOOD, DRINK AND ANIMAL FEEDING STUFFS. DO NOT HANDLE TREATED FABRICS UNTIL DRY AND AIR THOROUGHLY BEFORE USE. Do not spray on a naked flame, electrical equipment or any incandescent material. Until dry, treated surfaces can pose a fire risk. This product is approved under The Control of Pesticides Regulations 1986, for use as directed. This product is notified for sale by the Pesticide Control Service under the Biocide Product Legislation in Ireland. For use indoors against crawling insects such as fleas in domestic situation. For use on animal bedding, carpets, soft furnishings and cracks and crevices in flooring. For use only as an insecticide a 5 second burst releases 5g of product. Apply at a rate of 2.9ml of product per square metre of surface. Do not breathe spray mist. Do not contaminate food stuffs, eating utensils or food contact surfaces. This material and its container must be disposed of in a safe way. Extremely dangerous to fish and other aquatic life. Remove or cover fish tanks and bowls before application. There are currently no questions for Permaguard Flea Spray - be the first to ask one!